Source: William F Bacon (1887); published in English Dance & Song, May - June 1940, Volume IV, Number 5. In each minor set define the two couples nearest the middle as "There" and the two couples on the outside as "Here". Define "Inside" to mean take two hands and gallop inside the other dancers, and "Outside" to mean slip/walk individually outside the other dancers. C1 Lines of Four Go Forward & Back, shouting, "Fire! Fire! Fire! Fire!" Own 40 bar tune, suitable for shouting "Fire!". In the descriptions the terms "inside" and outside" can be very confusing, do they refer to certain dancers, or to which direction you are heading, or to whether you are inside or outside the other couples? Make sure you use clear terminology! Tell the dancers that you are always telling the outside (Here) people what to do first. Richard Powers acknowledges that the couples on the outside of the wheel gallop inward first in the 1926 and 1941 descriptions, but he suggests that the dance functions better if the inside couples gallop outward first, as they meet earlier during the pass through, being nearer to the centre of the wheel. "Right & Left" can mean many different things. Was it done with or without hands? With or without Courtesy Turns? 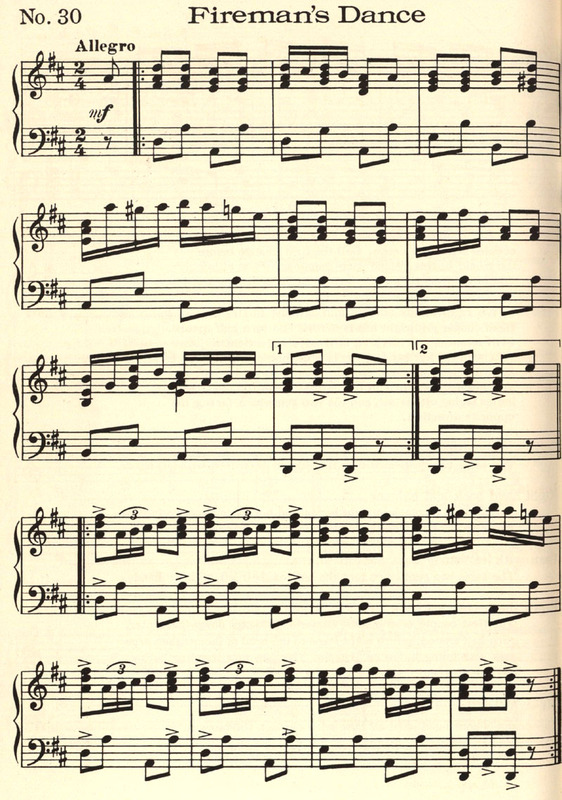 The EFDSS version say pass right without hands then pass left with hands, but which way does the man turn after passing? You can obviously choose whichever interpretation you like! 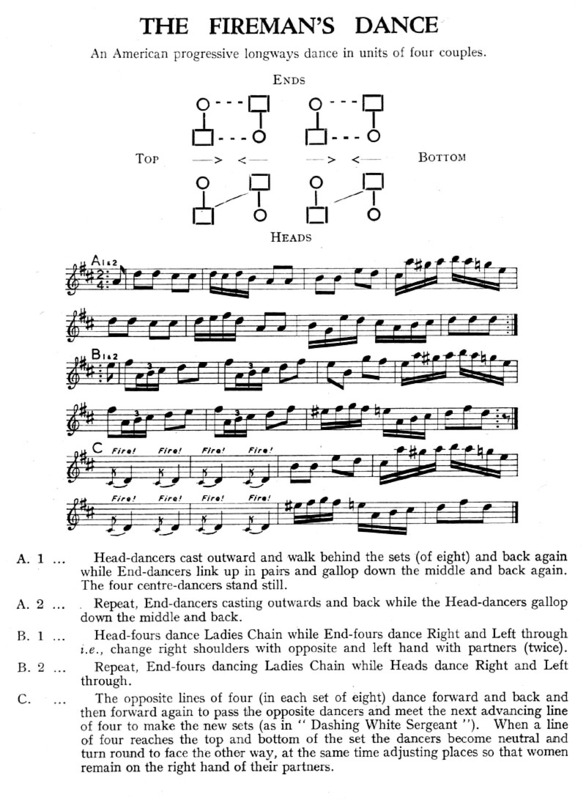 In "Good Morning" (see his version of the dance below) Benjamin Lovett says, "RIGHT AND LEFT"--(8) By two opposite couples; couples cross over, ladies inside, gentlemen in passing touching lady's right hand. When in opposite couple's place, gentleman take partner's left hand in his left and turns half around, and repeat back to place." The EFDSS version says that four people are standing still for the whole of the A part of the dance. This seems unlikely. This is a dance where, if you are in a Sicilian Circle, your position in your line never changes, so if you start out in the middle of the set you will never get to take part in the A music. It would be very crowded to have dancers trying to get both outside and inside the stationary couples at the same time. 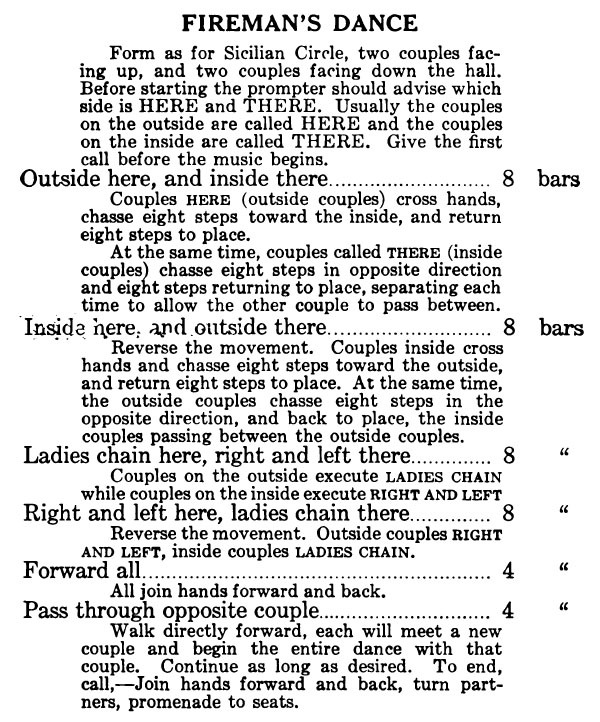 The 1926 version below specifically defines how the moving couple pass each other, if there were some stationary dancers then it would surely have mentioned their position. I don't believe anyone should be standing still at any time in this dance. The EFDSS version mentions casting, but I think that would detract from the simultaneous movement of the couples past each other, though of course they may have been using the term loosely. You can hear a recording of the calls; the orchestra is the Ford Ochestra, the caller may well be Benjamin Lovett. This is from around 1945. As far as I know this dance is not danced much in America or England now, however it is still popular in some parts of the world. Here and here you can see it being danced at High School Proms in Finland! The first version has dosidos in B2, and a power turn after the pass through to make it a four couple dance. 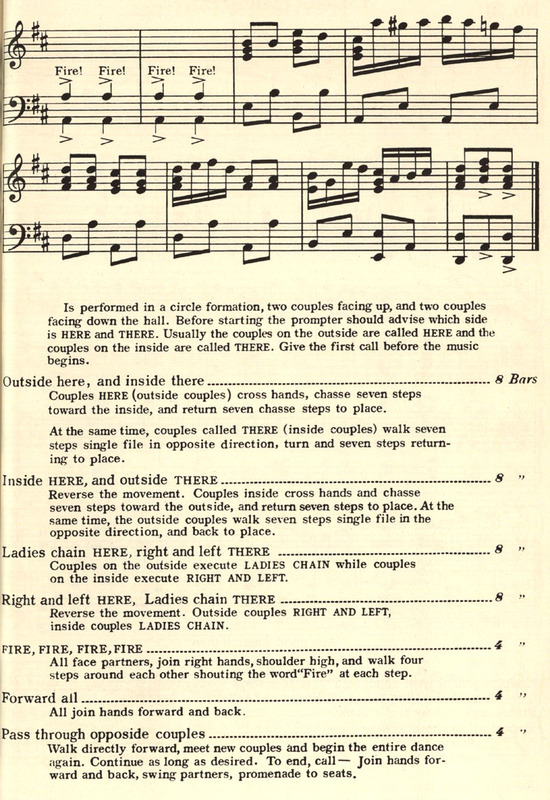 The second version shows two double Sicilian Circles, and for some reason they dance improper with a roll-away at the end of the second Ladies' Chain which has to be undone as they start the Ladies' Chain the next time through the dance. The earliest version I have is from "Squire's practical prompter; or, Ball room call book" published by A. Squire in Cincinnati in 1887. The Author was William F Bacon. Thanks to Richard Powers for the image. His document also contains an image of a Ball Card from 1865 showing "Fireman's Dance" as the last dance of the ball. James & Loretta McKinney have a recording of the music on their "Gems of the 19th Century". 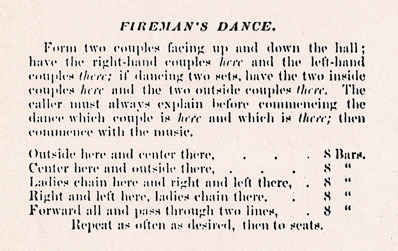 The sleeve notes say, "The Fireman's Dance - This lively dance was presented as part of an 1852 program of dances from Collins, New York, that also included Pop Goes The Weasel, Spanish Dance and Opera Reel." This version has also added "Partner Allemande Right" while you shout "Fire! ", and still has all the rest of the moves, but without any extra music! I would suggest that if you did this version you would drop the Forward & Back.